This is your chance to get a sense for the candidate’s style, both in childcare and keeping a home. Be sure to set your expectations up front. What household responsibilities are involved, if any? What benefits are there, such as vacation and sick pay? Be sure to know what your city/county/state require, and what the market pays. Will you expect your caregiver to coordinate vacation with you? What if your child is sick? Try to ask situational questions, like a case interview, so that you can find out how the candidate will respond to your children. Describe what it was like caring for the child that was most similar in age to mine. What do you do if a baby is crying? What would you do if you were caring for a ____ year old who hit you or kicked you? What would you do if you were caring for a ____ year old who did not obey you when you asked him to clean up, take a bath or get into bed? Any experience potty training? What would you say if a ____ yr old had an accident? How would you handle it if both a ____ year/month old and _____ year/month old were demanding your attention at the same time? What would you do if a ___ year old refused to eat the meal you made him? Even after saying that’s what he wanted? What type of food would you serve a ____ year/month old? Have you made baby food? What type? When do you introduce solids? Do you cook for ____ year old children? Are you ok with cloth diapers? If you were to spend a day with a ______ month/year old and _____ year old, what would you do with them? What do you think are reasonable responsibilities and expectations for a ___ year old around the house? Are you comfortable with [put in your family type, religion, etc here]? How well would you do in a home that is very [neat/messy]? [Get a sense of how the caregiver will leave your home. Discuss any household responsibilities, such as vacuuming after your child eats, putting away toys, children’s laundry, etc. What do you consider to be a healthy diet? For a live in, you are looking for a roommate, someone who will keep your home the way you want it. Which household duties are you responsible for? What time do you go to bed and what time do you get up in the morning? What do you do when you go out with your friends? How important is exercise to you? How often do you exercise? What do eat for breakfast, lunch, and dinner? What are your favorite TV shows? How often do you watch TV? You’d like to find out what role childcare is in the candidate’s future. Some will want a career nanny, while others will want someone with a long term goal to do more. What are you looking for in a family? There are a number of au pair agencies to choose from. 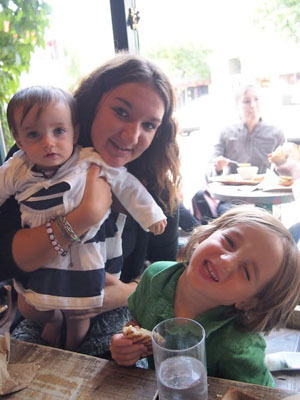 I am on my third au pair from Au Pair Care (http://www.aupaircare.com). One Last Important Note: Be sure to do a background check and check references even if you are using an agency that does it. Glad the questions are useful! Those stories are very scary which is also why we recommend doing your own background and reference checks (though they aren’t a guarantee, either). Installing cameras in the home might be an option, depending on local laws about secretly recording people. For example, in California you cannot record someone’s voice without the knowledge of the person you’re recording. (We are not attorneys.) Many families might prefer coming home at different unannounced times or peeking in on the playground especially in the early months. Children who are verbal will often show signs of how they feel about the nanny or au pair. For au pairs and other legal immigrants, the State Dept does a background check before issuing the person a visa to come into country.